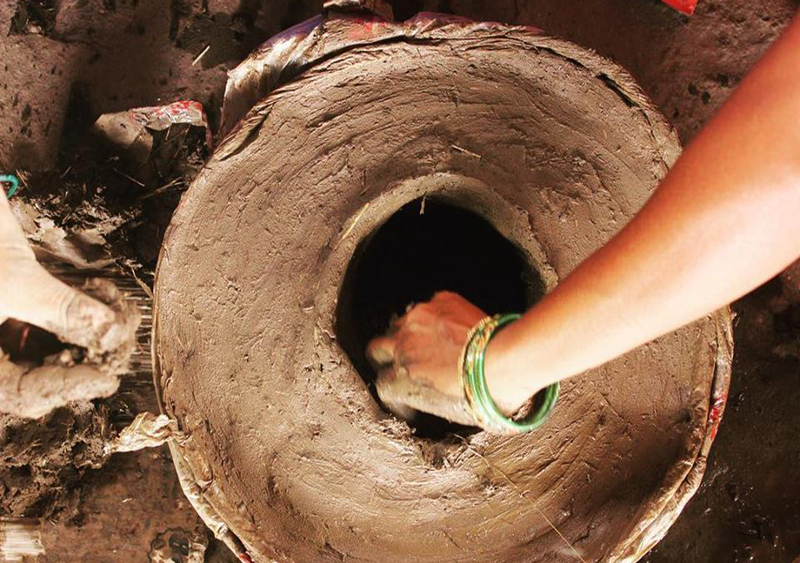 My nails and finger tips still bear red as I write this blog based on our experience in Koduru, Andhra Pradesh. And in a manner speaking, I wish they remain stained red. For it’s the red of the earth that I had never seen or touched and played with. 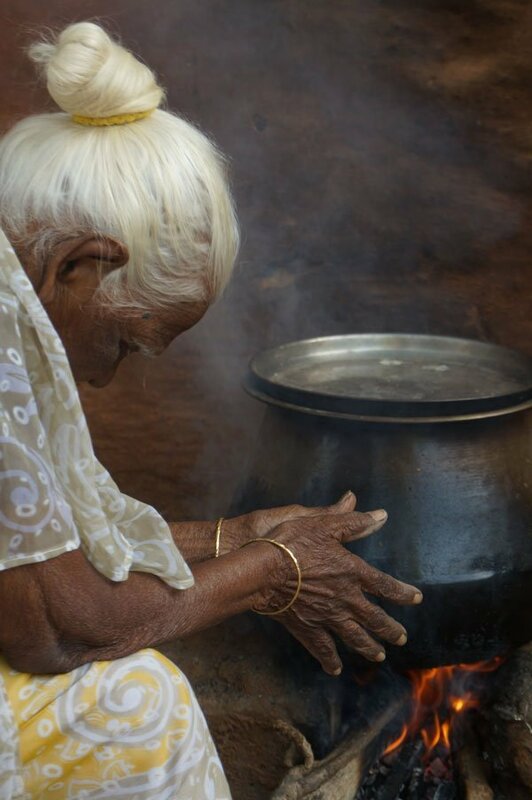 2019 has had an interesting and action packed start for Smokeless Cookstove Revolution. 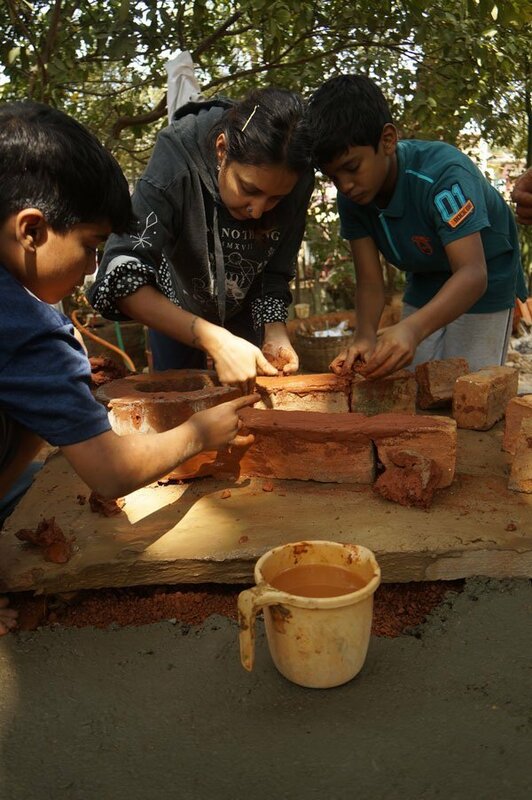 We set out to initiate a new project for training community volunteers in the state of Andhra Pradesh. New geography, new partners and lots of incredible exchange of ideologies. The place where we ventured with our revolution this year is Koduru, in Kadapa District of the state. A little geographical background about this incredible little town. Neighbouring Koduru are the lesser known but mystically alluring Seshachalam ranges, which falls on the southern part of the Eastern Ghats, covering an area of 4,756 sq km in the districts of Chittoor and Kadapa. Interestingly, Seshachalam became the first biosphere reserve in the entire State and 16th in the country. The Seshachalam bio-reserve, among other areas, also includes Sri Venkateswara National Park of which the famous hill temple town of Lord Venkateswara too forms a division, besides Sri Venkateswara wild life sanctuary and the Idupulapaya. This bit of information about the forests is important as one of the major objective of our project is to reduce the usage of firewood. 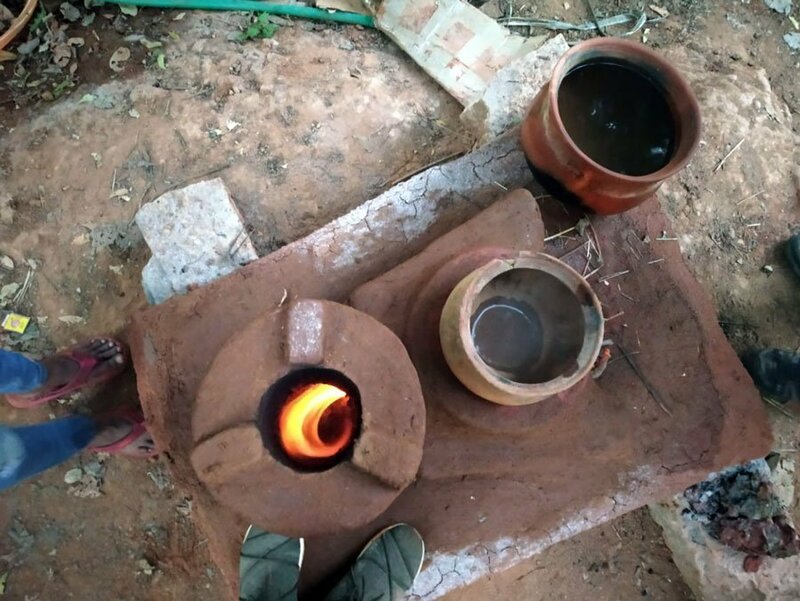 While, there seems no dearth of available forest fire wood in the current scenario and there is acceptable penetration of LPG in some of these areas, the idea for us to introduce our ‘zero cost and highly efficient smokeless chulha is to simply offer a more sustainable and closer to traditional way of cooking using ‘Rocket Stove Technology’. We work in the hope that successful implementation will prompt scalability in the villages and tribal hamlets where there serious concerns about health amongst women and children due to indoor pollution and, of course, fast depleting forest cover. Our partner and host for this project is Dr Abraham Thomas, whom I would like to call a ‘Grass Roots Eco Warrior’. A medical man by knowledge and profession, Dr Abraham made the journey back to his native village to introduce a more connected and close to nature way of living. According to a newspaper article articulating his community work, it is interesting to note that “Dr Abraham adopted the Bayana Palli MPP School in the village located about 50 kilometres from Tirupathi, eradicated the defecation problem by building up toilets — one for the boys and another for the girls, implemented solar power to save on electricity, brought in clean water supply along with gates and compound walls that a school must have, but didn’t. 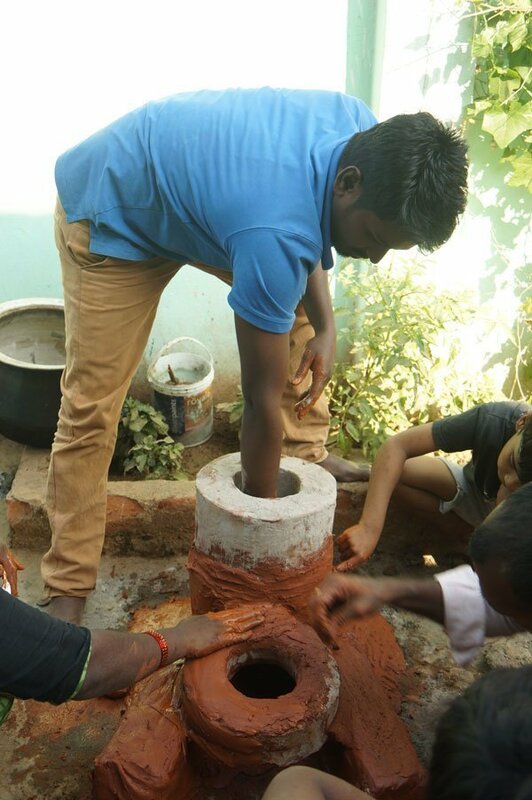 The school’s attendance naturally rose, and numbers have gone from 30 to 100.” His single-minded focus to change things at the grass roots made him an obvious choice for Smokeless Cookstove Revolution to join hands with. As we entered his turf, we were overwhelmed by his world and just how much of an effort he has put in to make his passion come to life. Our workforce of community volunteers are an enthusiastic army of young students and helping staff who are being mentored by Dr Abraham to follow their heart. Within no time, they made twenty odd donuts. Perks of this wonderful community event were Dr Abraham’s two sons Thomas (12 years) & Simon (10 years), who not only took centre stage during our workshop but acted as fluent translators for us non Telegu speaking Mumbaities. Our evenings would end with carom games with these highly energetic and wonderfully grounded hosts. Such is the power of this revolution, that in less than 24 hours, we became best friends with the wonderful people of Koduru who welcomed us with open arms and love. 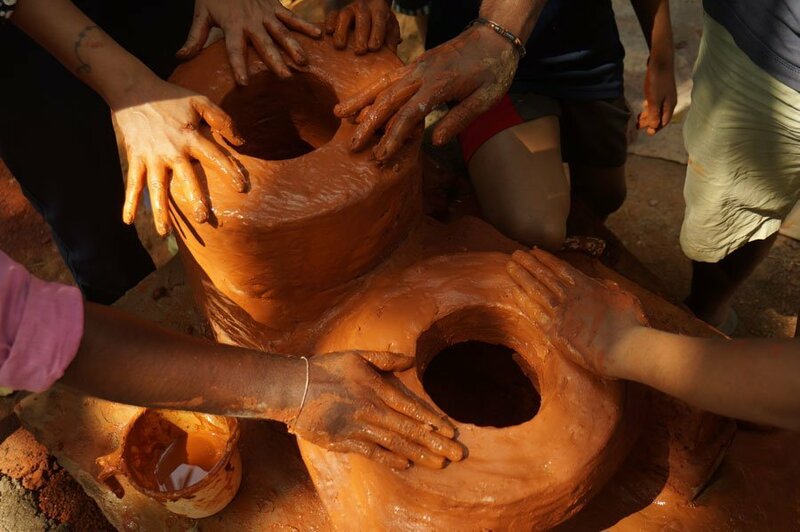 The real work started from Day 2 onwards when we began teaching the community of a few people (we were hoping for more participation) to learn our process of assembling the smokeless chulhas. 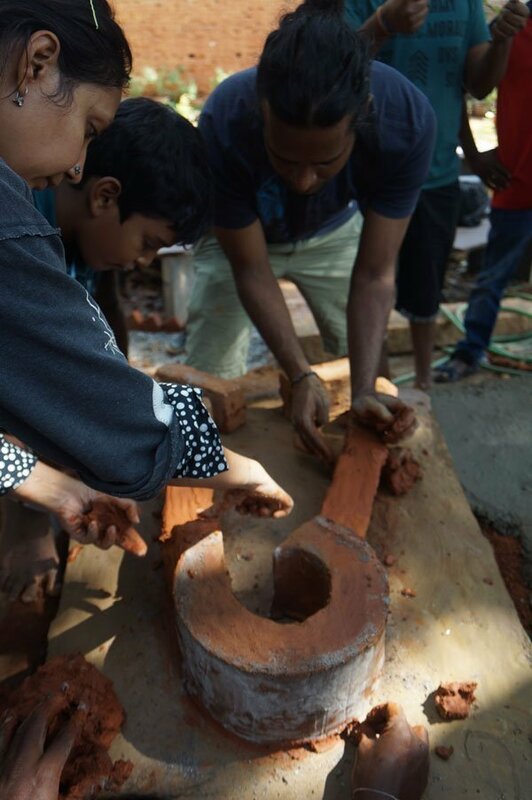 While the properties of red clay kept us fascinated, we learnt that the nearby village communities are not so positive about coming to learn something new that could be of benefit to them. Instead, we had to go to them with our solution. With the help Dr Abraham’s staff who were our training team and his sons, we visited two villages – Thadivandlapalli and Jyoti Nagar. Both the villages essayed similar dynamics; population of about 25 to 30 families, agriculture being the main source of livelihood; more than 75% of homes using both LPG and mud chulhas and no real problem in procuring the wood. 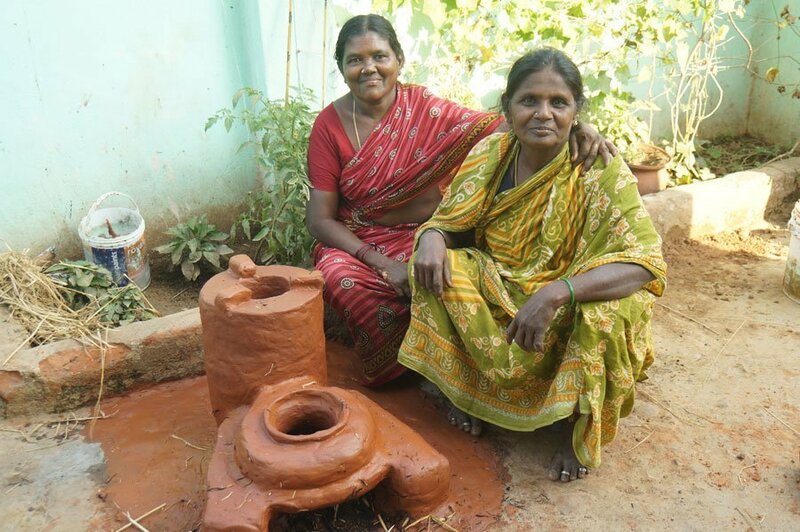 So, why would they be interested in adopting our solution of making a smokeless cookstove based on Rocket Stove Technology? 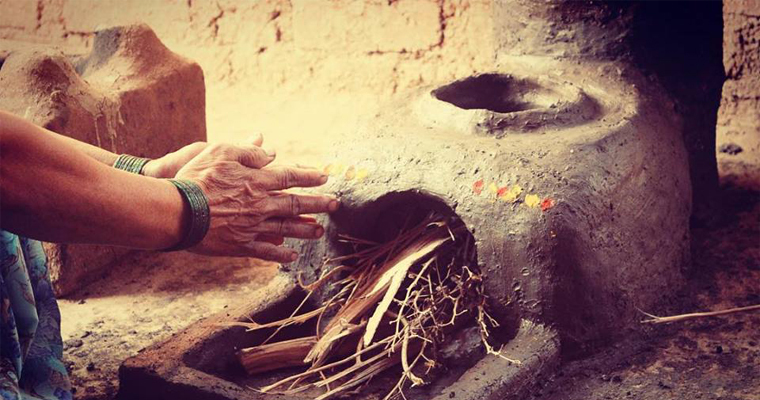 Dr Abraham believes that it will bring back the concept of sustainable cooking on mud stove but in a more efficient option. It can also provide an additional livelihood opportunity to people who become community trainers. Also, because at some point in time, we will run out of firewood and yet people will never give up the chulha usage.And we are believing in Dr Abraham’s vision. We felt that the community will not welcome or even accept our idea if we do not have a grass roots visionary taking this forward. With the help of our community trainers, we installed one chulha each in both the villages and found keen interest the moment we fired it to test the vortex. 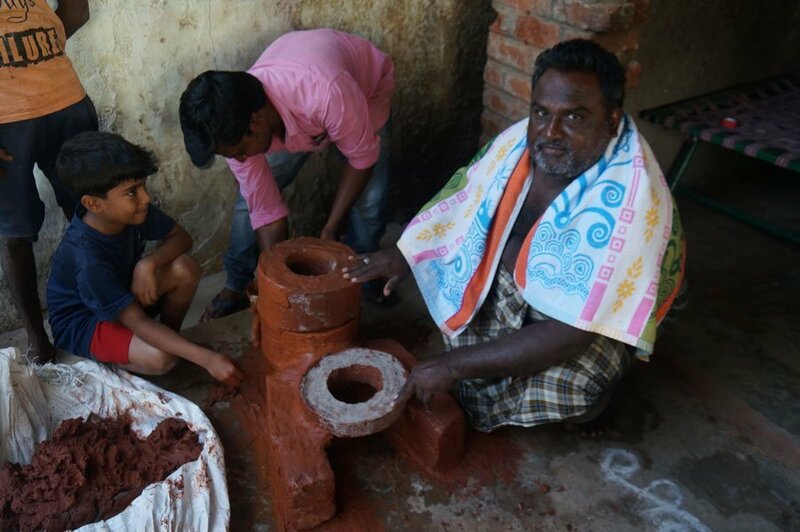 But it will be interesting to see how the revolution spreads after the Smokeless Cookstove team leave Koduru. We generally like to interact more with the end users of this solution to understand their issues related to indoor pollution and chulha usage. This one factor was majorly missing from this training programme. We hope that this changes in future as we believe that this is just a humble beginning. 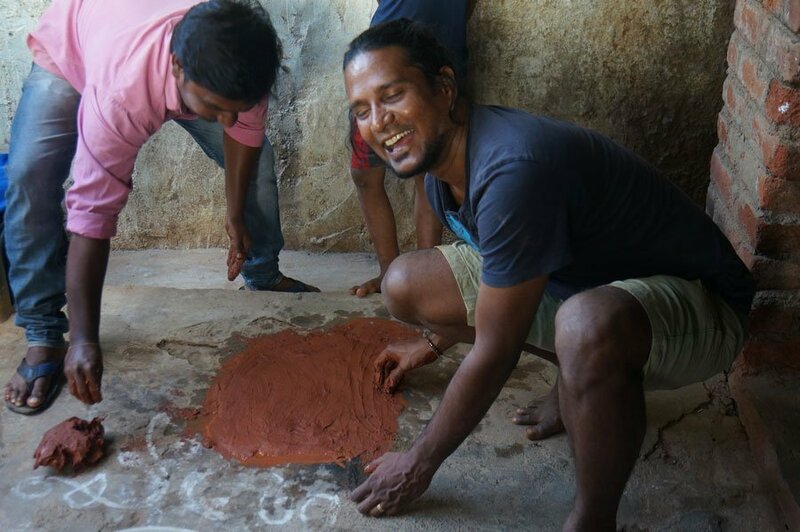 Our stay at Koduru gave us a glimpse of local culture and food habits. Just on the verge of celebrating Makar Sankranti, Dr Abraham’s family opened doors to the community at HutK for evenings of getting together and rejoicing in this harvest festival. A bit about “Makar Sankranti”, it is often called the ‘Harvest Festival’ and is celebrated to commemorate the beginning of harvesting crops in the fields. Sankranti marks the biggest festival in the calendar of the fairs and festivals in Andhra Pradesh. 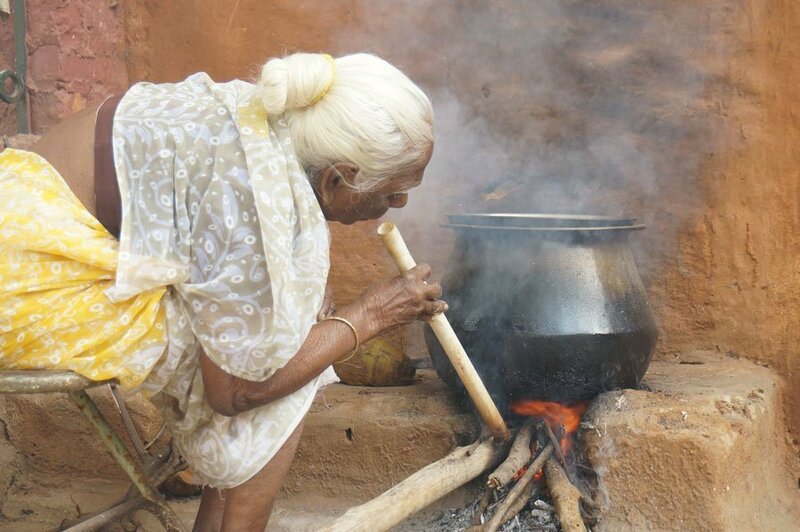 I personally felt we were extremely lucky to have experienced such a wonderful timing while at Koduru.Nutritious food is the rightful companion to our smokeless chulha. We had the pleasure of inaugurating our chulha with a fresh and hot meal of simple healthy food. What this means is that when all the natural elements take form in a rightful partnership, we have a sustainable idea. The journey and success of this revolution lies in this context. Right attitude, meaningful partnerships, people willing to open their minds to possibilities and simply holding hands. 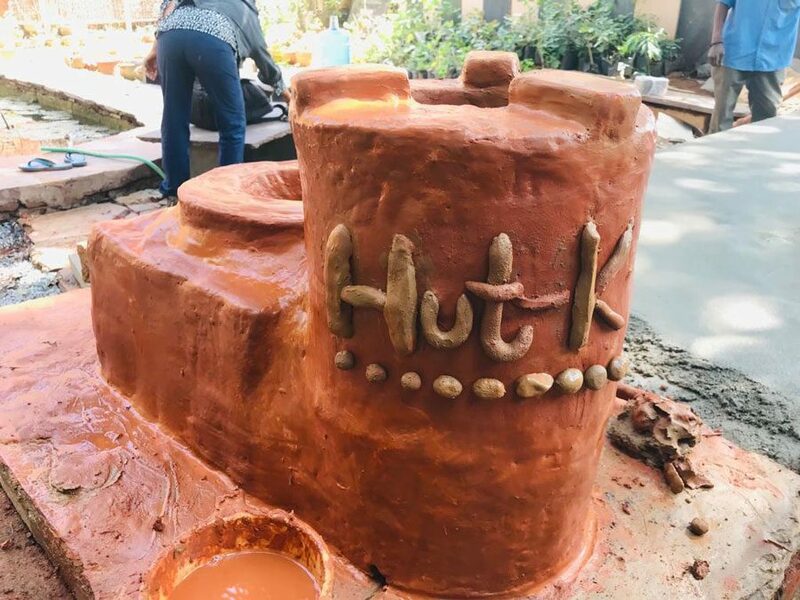 So with a team of 5 community volunteers trained, evangelists and mentors in Dr Abraham’s family, 4 successfully installed chulhas, the Smokeless Cookstove Foundation team (Ralph & Nitisha) are hopeful that Koduru becomes home to clean burning fire for a long time to come. The film presents a project in Nyanza province, Kenya, where improved cook stoves have been introduced to subsistence farmers.